A suspected water plume erupts from Jupiter's icy moon Europa (visible at the 7 o'clock position at lower left) in this composite image taken by NASA's Hubble Space Telescope on Jan. 26, 2014. NASA unveiled the image on Sept. 26, 2016. Good news on the alien-life-hunting front: The towering plumes emanating from Jupiter's ocean-harboring moon Europa appear to be real. In late 2012, NASA's Hubble Space Telescope spotted what seemed to be 125-mile-high (200 kilometers) geysers of water vapor erupting from Europa's south polar region. This news was exciting for astrobiologists and space geeks alike, for it suggested that a robotic probe may be able to sample Europa's huge global ocean — which lies beneath the moon's miles-thick icy shell — without even touching down. A team led by William Sparks of the Space Telescope Science Institute in Baltimore used Hubble to hunt for Europa plumes on 10 separate occasions over a 15-month span. They had success three times, spotting apparent plume activity in January, March and April of 2014. "They appear to be real," Sparks said during a news conference today. "The statistical significance is pretty good, and I don’t know of any other natural alternative." Still, Sparks stopped short of calling the repeat detection a definitive confirmation. The newly announced detections were made when Europa passed in front of Jupiter from Hubble's perspective, and plume material seemed to block ultraviolet light coming from the giant planet. The observations Hubble made are right on the edge of the iconic telescope's capabilities, Sparks said. "We remain cautious," he said. "The problem is that there may be something we don't understand about the instrument, or about our model of the scene, or what Europa looks like in the ultraviolet light." Analyzing the Hubble data is also a complex process, which explains why the team is revealing the detections now, more than two years after they were made, Sparks added. Two images of Europa created in 2012 and 2014 by separate research teams using different observation methods reveal activity at a common location on Europa. The transit image on the left shows dark patches of light absorption in the same spot where researchers later found auroral emission from hydrogen and oxygen, the dissociation products of water. The 2012 detection, which was actually announced in December 2013, was made by a different research group, one led by Lorenz Roth of the Southwest Research Institute in San Antonio. Roth and his colleagues used a different method to spot the apparent plume, but the two teams' observations dovetail nicely; both conclude that the plume is about 125 miles high and centered in Europa's southern reaches. The plume's likely existence should influence the planning of NASA's Europa mission, which the agency aims to launch in the 2020s. This Jupiter-orbiting mission will make multiple flybys of the moon over the course of several years, in an attempt to learn more about Europa's ocean and its potential to support life as we know it. 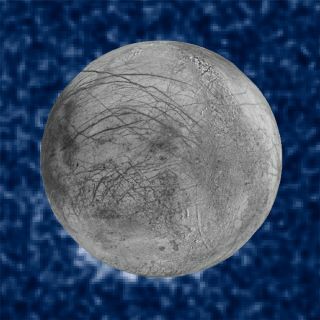 "Today's results increase our confidence that water and other materials from Europa's ocean — Europa's hidden ocean, hidden under miles of ice — might be on the surface of Europa and available for us to study, without landing and digging through those unknown miles of ice,"said Paul Hertz, director of the Astrophysics Division at NASA Headquarters in Washington, D.C. This illustration of ridges and fractures on Europa shows one possible way that water could reach Europa’s surface. Chloride salts in the underground ocean bubble up to the moon's frozen surface. The combined Hubble observations also show that the Europa geysers, if they exist, are intermittent phenomena. If scientists learn more about when and why the geysers erupt, it might even be possible for the as-yet-unnamed NASA mission to fly through a Europan plume. "One of the biggest unknowns we have with these putative plumes is understanding their timing," said Curt Niebur, the Europa program scientist at NASA Headquarters. "And I think the more observations we can get with Hubble and with JWST [the James Webb Space Telescope, which NASA aims to launch in 2018] to better understand that, the better we can use that to construct a schedule for when we search for these plumes at close range from the Europa flyby mission." Sparks and his team are publishing their results in the Sept. 29 issue of the Astrophysical Journal.